UPDATE: We are officially SOLD OUT. A few spots are still available for the Hardware Hacking music toys Workshop http://bit.ly/1SMc8ll - grab them while you can! In case you&apos;re wondering: the background is a nod to Bit International. Hackaday | Belgrade from Aleksandar Bradic on Vimeo. The conference badge is coming together. @Voja Antonic has been hard at work on the design and just published the first details over on the conference badge project page. Thank you guys for this event! I had a wonderful time in Belgrade, starting with staying in the arkabarka hostel. We tried to get some of the staff to register on hackaday.io, since they were engineers and loved the #Tote HaD that @M.daSilva showed them. We tried to see all of Belgrade up until we almost missed our flights. Well also because we were on the wrong side of the street, but the most awesomest reception girl Anna let her bus leave when she saw us looking lost and called us another taxi and everyone got home that day. Belgrade had a lot to show us, the food was great, the weather was nerd friendly and the grass was growing wild. As for the event, the bands were really good! But maybe a non band / non DJ event would have been better. Not sure why there always has to be loud music with dancing, when we&apos;re there to talk to people and show off projects, not our probably missing dance moves. Maybe someone could come up with a name tag machine that also prints the &apos;best&apos; / &apos;favorite&apos; project of a hacker on HaD.io plus the online name - there are definitely some missed opportunities for smalltalks because we&apos;re all shy people and nobody wants to brag about stuff, when surrounded by smart people. The catering was so tasty, the coffee was great, especially when drunk from the coffee mugs we got with our bags! Nice goodie bag btw. WiFi worked out well, so five stars! I still have to find out how to work with the MPLab IDE, but the badge was an awesome creation and I loved the programs that everybody came up with for the contest! Now I have to wait for the videos of the talks, since I had to actually work on that day... damn you job that&apos;s possible to do from everywhere. But I was glad to escape the AC for a while, you could definitely tell that people were smoking in that "conference" room for years. So 4.5 Stars. @Radomir Dopieralski allowed me to sneak into his #Tote HaD workshop, so I could work on my version, that I had to completely take apart and rebuilt again :D There are already some nice additions to the Tote, thanks to this event and the collaboration this platform allows. Awesome! So once again, thank you guys! I drove from Timisoara(Romania) for this event, and it was definitely worth it! Thanks to everybody that made this possible in Belgrade, the food was great, the talks were great and seeing Voja presenting the badge and talking about the issues was awesome, he is truly a great hacker! I hope to be able to attend these conferences soon! Thanks for the awesome event! Also, the music between the talks was nice. Can I find it somewhere online? Not sure where to put feedback, so I will just post it here. Hopefully you will find this useful. * The music was *way* too loud in the evening. It was impossible to talk two rooms away. We ran away, and noticed the bus stops outside the building are vibrating. I&apos;m sure it&apos;s possible to party with fewer decibels, but I guess it&apos;s a matter of taste. I came there mostly to meet other hackers and to talk with them, and that was pretty much impossible. * There was no names on the conference badges. Because of that, I probably met much more people that I know from Hackaday, than I realize, but didn&apos;t recognize them. Which is a great shame, because we could have talked about their projects, if I knew who they are, instead of general niceties. * The food was fan-ta-stic. Really great! * The live streaming was very useful. I had to prepare for the workshop, so I couldn&apos;t stay in person, but I still got to see most of the talks on the stream. * The talks were great. * The badges are really cool, and I wish I had time to play with them some more. If I had the time, I could make them control the robots! Girls, boys... This was a fantastic experience for me. 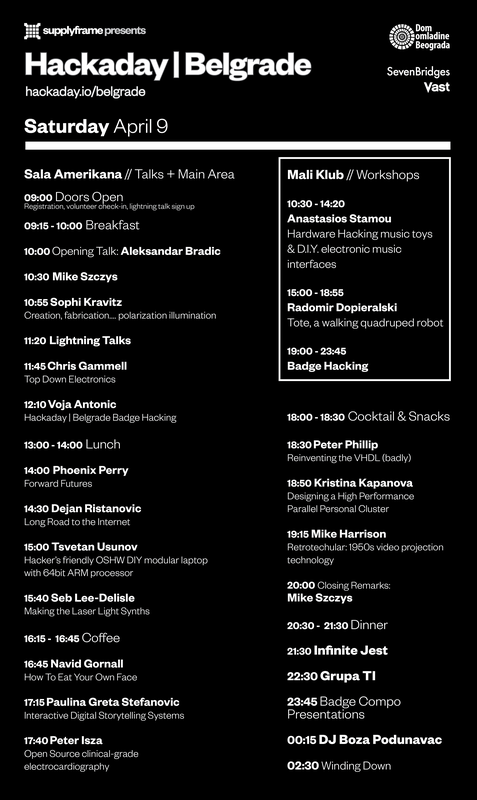 Thanks for organizing this hackaday it was a pleasure to be a part of it. Hope to see it come back next year. See you guys, I am coming with my friend. Lol, we&apos;ll squeeze you in, but can&apos;t guarantee a badge. Just send me your email via private message. Is it possible to buy "Workshop 2: Tote, a walking quadruped robot" ? i see in evenbrite is SOLD OUT, but really i want this workshop. If in evenbrite is all sold, it will be possible in Belgrade to buy it ? I&apos;m very sorry, but I can only handle so many people in one room at once -- especially when it&apos;s an interactive workshop, involving building a physical thing and helping everyone individually. I will bring some extra printed circuit boards with me (and @davedarko wanted to bring some too), so you can build one at home. Tickets booked ;) See you all! I will bring a couple of screwdrivers, wire cutters and such, and also USB2TTL adapters and wires for them -- that&apos;s all that should be required. I will do all the soldering at home before the workshop, because it&apos;s kind of tricky. davedarko!!! this is going to be amazing. Yay! See you in Belgrade. Any news on new ticket provider? Eventim ended up not working out but we have an alternative (ticket reservation + onsite payment). Will ping you on PM with the details. You are about to report the project "Hackaday | Belgrade", please tell us the reason.